Westdyke U17s secured a fam-ous victory for a local boys team from Aberdeen against the national team of Malta in the Centenary Stadium, Ta’ Qali last Friday. The match was played over three periods of 25 minutes at the request of the Malta management. This suited Westdyke due to the hot conditions and the players not being acclimatised to Malta. The first period started with Westdyke imposing themselves from the whistle, pressing and closing the Malta players down and stopping them passing. The central midfield pairing of Dylan Grimbley and Rory Brown were strong and created opportunities for the forwards and wing players. Greig Cowie was constantly a threat to the Malta defence and hit the crossbar. 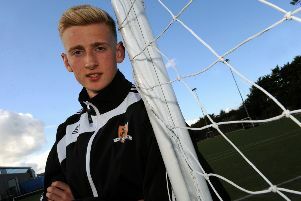 The best chance saw Euan Walker going through after a Malta defender slipped – he rounded the goalkeeper but the ball had too much pace and went behind for a goal kick. Malta had a good chance to score ruled offside but Westdyke had been the dominant team in the first period. Malta changed their whole team for the second period. Westdyke made three changes, bringing on Nathan Rankine, Max McGinlay and Josh Duncan for Dylan Grimbley, Euan Walker and Blair McKenzie. Westdyke continued to press, Nathan Rankine in midfield frustrating the Malta players, stopping them playing and firing creative balls to the forward players, while central defenders Finlay Wood and Reece Taylor were excellent. Malta made a dangerous attack late in the second period and shot at the Westdyke goal but the Westdyke keeper Jamie Butler, who had not had to make any meaningful saves, stopped a certain goal with his foot. Westdyke did not create any meaningful chances but were awarded several free kicks from which they were unable to take advantage. Malta made changes to their team again in the third period while Westdyke substituted Rory Brown, Greig Cowie and Stuart Gilmour by bringing Dylan Grimbley, Euan Walker and Blair McKenzie back on. Westdyke started positively and again continued to press. Max McGinlay, ever a threat, lost his defender and shot at goal but the Malta goalkeeper made a comfortable save. Josh Duncan was having a great battle on the left wing with a very good Malta winger, going past him and taking on two other defenders but his attempted shot was blocked by another defender. Malta chances were limited but the Westdyke goalkeeper was commanding. On the 12th minute McGinlay, under pressure from two defenders, played a great through ball to Walker, who took one touch and struck the ball from outside the box. The goalkeeper had no chance and the ball hit the back of the net. The Westdyke players celebrated the goal in style! The momentum was with Westdyke and they sensed victory. They continued to dominate but with eight minutes to go Walker suffered a knee injury and was replaced by Cowie. An injured Ian Chalmers was givenfive minutes on the right wing, replacing Blair McKenzie. The Westdyke coaches wanted Chalmers to play some part in this event and he worked hard and played as if he was not injured to the end of the match. The referee blew the final whistle to spark scenes of great delight among the Westdyke party.